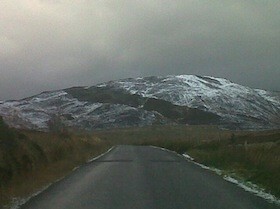 MANY roads across Donegal today are treacherous after temperatures dropped below freezing overnight. As the wacky weather continued, so does the wacky forecasts! The BBC in the North however still believes there could be snow in Co Donegal this evening. Gardai and AA Ireland are warning motorists again to be careful today following overnight frost. Many wet roads have frozen over. Temperatures dropped below zero just before midnight on several main Co Donegal routes, the National Roads Authority said. Met Eireann is warning of coastal floods along the west and north west coasts for next week as the unsettled weather continues. Yesterday at Malin Head winds gusting to 160km/hr (100 mph) were recorded and power was cut to hundreds of homes.